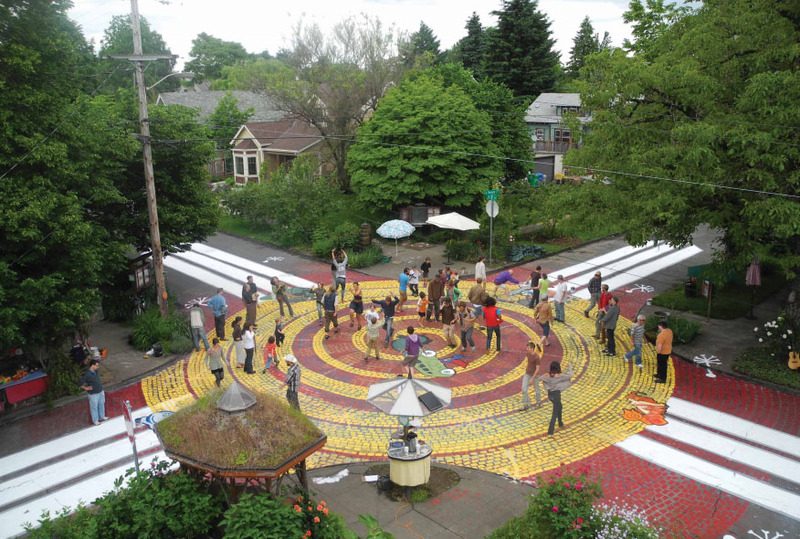 Sometimes all you need to create a great public space is a gesture that makes people feel welcome and comfortable: Mark Lakeman realized that public gathering places could be retroactively created out of normal street intersections in his Portland neighborhood with some paint and community effort. City Repair, the organization he founded in 1996, is an almost all-volunteer organization that gathers communities to paint murals on street crossings and to add other improvements, like benches, information boards, and plantings, yielding lively new focal points for their neighborhoods. They started with Share- It Square and Sunnyside Piazza, and have since expanded to dozens of intersections across the country, where neighbors gather annually to repaint and update their community spaces.